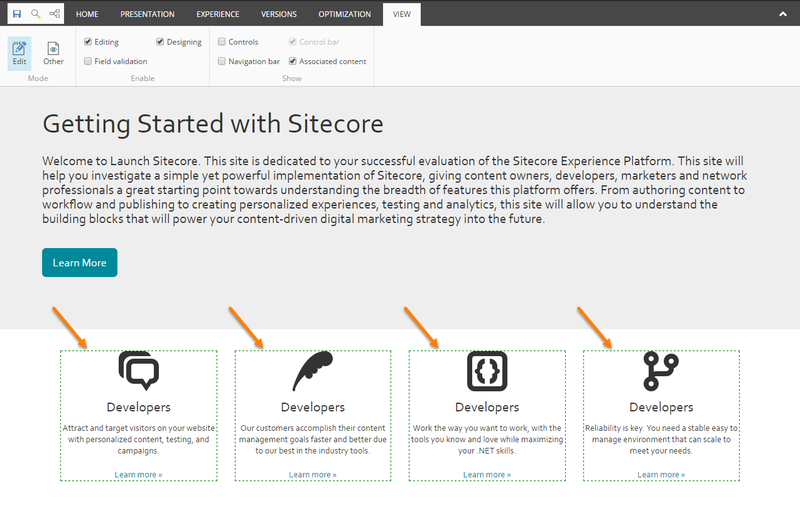 The launch of Sitecore 8.2 just a few days ago brought with it a a huuuuuge list of updates and enhancements. 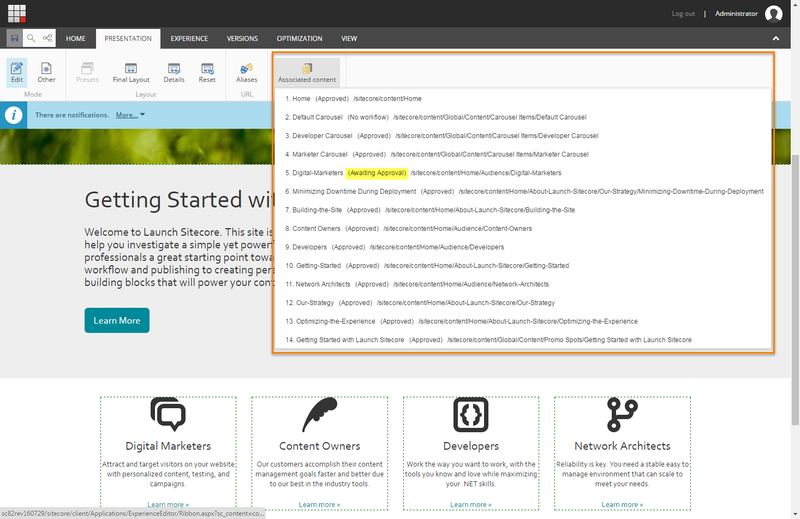 One of those great new features is an update in the Experience Editor to make the life your content editors much simpler and better to managing the content through workflow. Component based design/architecture seems to have gained a lot more traction again in recent times especially with the Habitat project. 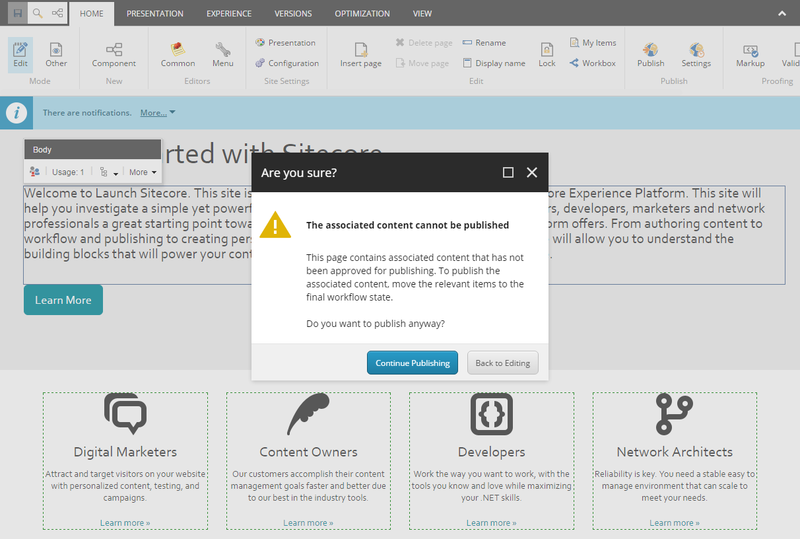 But Sitecore itself has fully support component based design since version 6.4 (at least) with the numerous enhancements that were made to the Page Editor in that release to add better support for Datasources. In order to fully utilize all the analytics and personalisation features, you have to use datasources, you’ll be fighting the framework if you don’t. Due to its page-based nature, the Page Editor/Experience Editor has also had problems giving appropriate information to the editors when dealing with heavily data-sourced pages and content items that may be used on several pages. You don’t know where a datasource is used. Making a change on a component in one page may affect several other pages when the datasource is shared or used on multiple pages. You can’t be sure that a page will not be broken after publishing. When you workflow content, you don’t know what state a page is in as a whole. Although the page item itself is in the Approved/Final state of workflow, the associated content used on that page may not be. Therefore publishing a page even with the “publish related item” option would still not publish those non-final datasources. Component Error handling – If all goes wrong, handle/shallow the error so the user is not shown a 500 page. In Experience Editor mode, there is a new option that can be enabled from the View tab of the Ribbon. 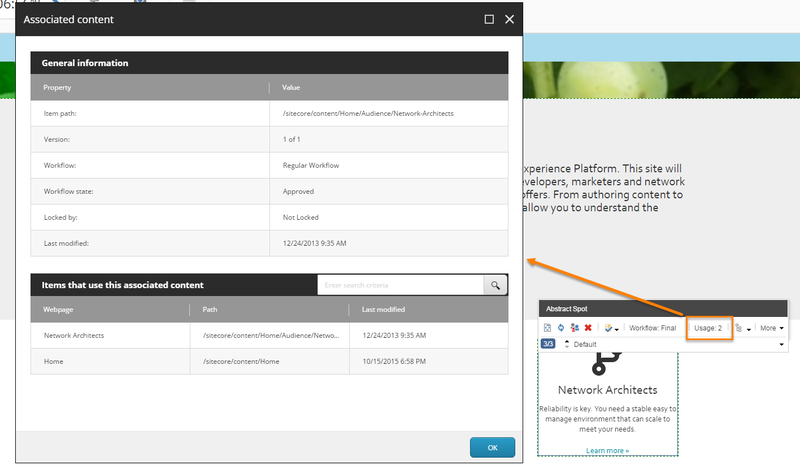 Turning on the “Associated content” option will highlight with a green dashed frame all components on the page which have a datasource set. The component webedit toolbar has also been extended to show the workflow state of the components associated datasource. The eagled-eyed amongst the readers may have noticed in the previous images a new usages counter in the component webeedit toolbar as well. This will give the content editors a lot more confidence when updating content to know exactly how many times a piece of content is used and how other parts of the site this single change will also affect. The use of component based design can lead to heavily datasourced pages, and it may become difficult to track exactly what content items are used on a single page. You’ll also be present with a warning if you try to publish a page which contains datasources which are not in final workflow state, which could cause a 500 error if the page were published in the current state. As part of the Workflow, a new feature has been added that will move all datasource itmes on a page through the workflow at the same time as when the main item is moved through the workflow. This should help ensured that when an editor meant to “create a page, add content, approve it and publish to the website”, this is what actually happens. This has been added using feature toggling, so you can disable it by setting WebEdit.AffectWorkflowForDatasourceItems to false. That should make everyone’s lives a little easier. Does WebEdit.AffectWorkflowForDatasourceItems only work if the page & data sources are in the same workflow? What happens if the page & data sources are in different workflows, how would it update the data sources to the next corresponding workflow state? Is there any documentation on this? Great article – I did not know this had been introduced! We used to have to implement something similar as a customisation to work around this not being there. One question though – any idea if this is expected to work in Content Editor and Workbox or just Experience Editor? A couple of quick tests suggests it’s just Experience Editor…which is a nuisance. 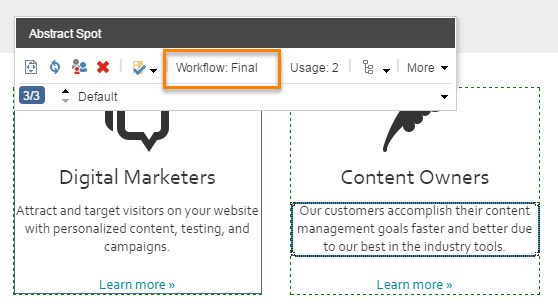 I don’t know off the top of my head I’m afraid, I’ve been working on older projects using the customer Workflow action like most people have to provide this functionality… seems surprising that it’s EE only… I would raise this with Sitecore Support since I would expect it to work in all modes. I’ll dig into the code to take a look if I have time. No worries …I did raise it with Sitecore, and the response this morning was that it only works in EE. They’ve put in a feature request for it to cover all areas. Bit of a shame…but I guess we’ll need to stick with custom implementations for Content Editor and Workbox for now.